Launched only six months ago, Google+ is the new kid on the social networking block. Despite the late start, it's becoming increasingly useful and important for small businesses. Here are seven ways Google+ can be useful to you at work. If your business provides any type of product or service to the public, you need to have a presence on Google+. Like Facebook Pages, Google+ Pages are a destination for anyone seeking information about your offerings. Users can “follow” you by adding you to one of their Circles. If you want the people in your business to be noticed on the Internet, each one of them should have an individual Google+ profile. Each time you write an article or blog post, include your email address and a link to your Google+ profile. In Google+, create a link back to the article or post, which will tell Google you are the author. When the post shows up in a Google search, your picture will appear beside it, with the option for a user to add you to a Circle directly from the search page. The number of Circles you are in will appear as well, giving you instant authority as your numbers grow. Google+ Chat is the same as chat in Gmail, but it includes people in your Circles. It works great for instant messaging, audio, and video chats with your colleagues and even customers. The chat area in Google+ shows if they are online and if they can video-chat. You can then communicate with them by simply clicking and typing. 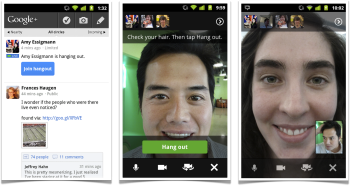 Hangouts is a free video conferencing tool that allows up to 10 participants, and focuses its main screen on whoever is talking at the time. It can be accessed by phone as well, allowing remote workers and those on the road to join group meetings. Hangouts also allows screen sharing, which combined with its On Air broadcasting and recording tools, make it an excellent presentation tool. It can also be used while sharing a Google Doc, taking remote collaboration to a new level. If you need to share ideas with colleagues or customers, Google+ is a great way to do it. You can jot down a note, or add notes to pictures or videos as well as links to Web pages, and then share them with a Circle of people. Only those in the Circle will see what you’ve shared, and they can reply back. It’s a great way to have an informal discussion about a topic. With Google+ now linked to Gmail, as you are reading an email, you’ll see any Google+ activity by its sender appear on the right side of your screen. This allows you to easily add people, such as customers and vendors, to your Circles, and automatically keeps your contact information up-to-date as well. If you use Google Reader to keep up with your favorite websites via RSS, it’s likely you run across articles you want to share with your colleagues. With Google+ integration, you can easily share an article with any circle you choose, so those people can read and comment, and of course share their own as well. JosephFieber has 25 years of experience as an IT pro, with a background in computer consulting and software training. Follow him onGoogle+,Facebook, orTwitter, or contact him through his website,JosephFieber.com.